A black bear runs across Rocky Fork Road, about one half mile off SR 125 after scavenging in some trash cans. There have been several bear sightings in the area this summer. Recently many people have reported bear sightings in the county, and a few lucky ones have snagged a photo of the rare occurrence. According to Jim Hill, District 4 Wildlife Officer, the sightings should be dwindling down as we enter further into August. 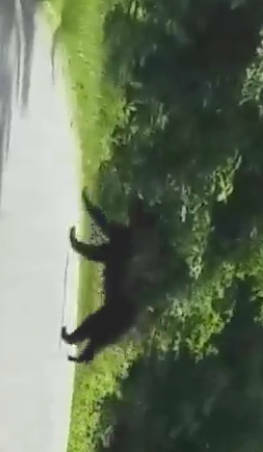 “June and July are the months where we have the most reports of bear sightings. It is during that time that the young male bears are leaving their mothers for the first time and venturing out on their own,” said Hill. According to the Wildlife Officer, bears move at such a fast pace that it is rare to see a bear for a second time in the same area. “Bears can travel 25 miles in a single day,” said Hill. For these reasons, according to Hill, there is no official count of the number of bears that are in the county. If after eliminating attractants a bear is still hanging out around your property, Hill advises residents to contact the County Wildlife Office in Athens. In the off chance you should find yourself in the presence of a bear, Hill says stand tall, maintain your space, and talk to the bear in a loud voice. Hill stated that it is likely the bear is just passing through, and by staying your distance away you can prevent an altercation. As the summer months fade, and their months of hibernation are just around the corner, the sightings of these young bears will soon come to a halt. According to Hill, those that have been lucky enough to catch a glimpse of this elusive wildlife species should relish the rare occasion. https://www.portsmouth-dailytimes.com/wp-content/uploads/sites/28/2018/08/web1_Bear.jpgA black bear runs across Rocky Fork Road, about one half mile off SR 125 after scavenging in some trash cans. There have been several bear sightings in the area this summer.